My daughter’s been learning the facts of life at school lately. Naturally, she’s had lots of questions, most of them about the workings of male-female relationships. Before I could answer, my son jumped in. My son is a riot. He’s going through a hard time right now, but he’s generally a pretty funny kid. Oh, I’m sorry to hear that. I hope he feels better soon. Did you write about bees? I am slowly catching up with stuff in the inbox. 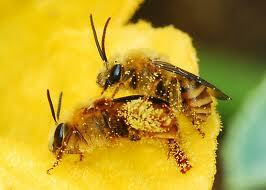 Love bees! Bees are cool – we try to plant stuff they like – did you see the article about how flowers alter their blooms with caffeine to attract bees? cool! I don’t know where he got this; his father doesn’t drink beer and, frankly, doesn’t go out with his friends, either. My son, the cultural anthropologist. It’s a calling – a curse and a blessing. Hahaha…his clever wit had probably saved you from having to delve into the more delicate matters when a man and a woman get married. Oh, if only it were true. We had an extensive conversation about how two women can have a baby together, as she knows some women who have had babies and are married to other women. It’s a riot when she finally gets something. Thanks. I think so, too!